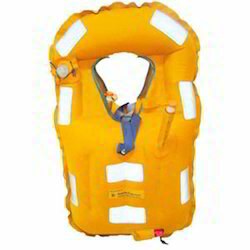 Raksha Life Jackets Inflatable Type are made out of High Tenacity Neoprene coated Nylon Fabric. The joints are made with high quality Neoprene adhesive. The Life Jacket is inflated manually through a mouth inflation tube which is provided. The Life Jacket provides flotation for one person weighing 80 Kgs for approximately 6 Hours. We are an ISO 9000-2000 Certified Small Scale Industry, mainly dealing with Rubber Coated Fabrics and Inflatables. Of late the company has diversified into Nuclear Biological & Chemical (NBC) Warfare protection & detection equipments. Raksha has a major business with the Defence Department. The commitment of Raksha to produce and supply quality products to the Defence Services is irrevocable. To Raksha Polycoats Pvt. Ltd., Raksha or "Protection" of our country is our ultimate goal and it is with pride that we take part in that effort. Apart from Defence orders, we are a major supplier of Water Sports Equipment such as Bananas, White Water Rafts and Harakiri Rides as per the requirement of the customers. We also supply Balloons for Bio Gas Plants and chemical storage applications. Raksha Polycoats Pvt. Ltd. has the WILL and SKILL to develop and deliver anything and everything in Rubberized Fabrics and Inflatables.